Every September for the past three years, we’ve spent a week at the beach. As you’re reading this (at least if it’s the first week of September when you’re reading it), we’re digging in the sand and wiping mud off little boy faces. The memories linger longer than one week though; I’m reminded of the beach all year. 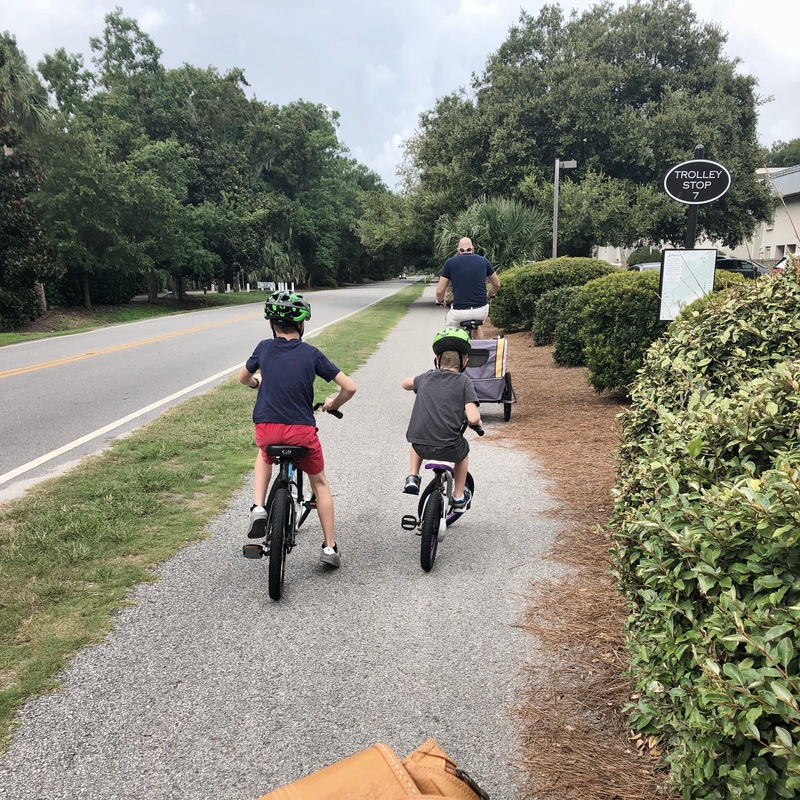 I’ll take the boys on a walk and, when one of them zooms by on a bike, I’ll picture the asphalt sidewalks and our parade of bicycles. We’ll order pizza in the evening and I’ll think about how, most nights at the beach, we put the boys in bed and get take-out for ourselves. I’ve never been to the new creation. I’d just say “heaven” but for most of that that conjures up thought of some other-worldly place where we sit on clouds and strum harps and that is decidedly not what I mean. I mean the new heavens and earth where God will dwell among us (Revelation 21:3) and be our light and we will reign forever and ever (Revelation 22:5). I’ve never been there but I have seen glimpses. Every flash of beauty, life, peace, joy is a signpost to that future existence. It’s a remembrance of how God made all things to be. It’s the half of reality that exists right along with the brokenness. I, myself, am a new creation (2 Corinthians 5:17), even if I’m not fully like Jesus yet (1 John 3:2). There are tastes, glimpses, just enough in the Bible to know that something familiar and yet completely different is destined. I love the beach. I love the expanse of the ocean and how the waves roll in and when the seagulls swoop low over the sand. Last year Caleb spent half his beach time chasing sandpipers who tried to consume their dinner to close to him. I love how soothing our time here is: how the sand and sun and water makes me a different kind of tired that lulls me to sleep on the couch at nine in the evening. I love how I relax enough to dream crazy, weird dreams. I love how we bike all over the island, finding lunch and frozen yogurt. I love that we have a tiny hole-in-the-wall Mexican place that we always visit. I love the beach for the experience of being there, although getting a short break from real life is also nice. We look forward to the beach every year. I have no doubt when we pull out of this driveway to head back home, the boys will ask about coming again next year. And that will be the plan, Lord willing. We will talk about it and look at pictures from this time and I’ll go back to remembering all the beauty of our beach trips and hearing seagulls as I fall asleep in Kentucky. I have to kindle my fire for eternity in a similar way. I haven’t smelled the air there, like I have the salty air at the beach. I haven’t felt that renewed ground under my feet, like the sand beside the ocean. Sometime I wonder if it can really be true, but that’s why it’s hope. It’s hope because I haven’t seen it and yet can’t give up believing it either. There’s enough to keep hope alive. Enough of God’s Spirit within me to stir up a desire for more. Enough of the Word with enough about the end of the story, or perhaps we should say, the beginning of the real story, that I stop trying to figure out when it will happen and live like it’s going to happen. That’s why I leave eternity, at the very least, in my peripheral vision coloring the rest of my life. Just as I’m sitting at the beach now, my hope is that I’ll stand in a new creation, being as Jesus is, made new.